Memorandum of Association (MOA) is a legal document which specifies the scope of business activities of the company and information about shareholding of the company. The MoA is a document prepared for the Company registration procedure. Sometimes, it is called the charter of the company other times, it is just called a memorandum. In most countries, the MOA has to be filed as an ROC Compliance which also includes articles such as MGT-7 and AOC-4 in India. In an attempt to ease the compliance of company incorporation in India, the Ministry of Corporate Affairs (MCA) has introduced online filing for company registration. The MCA wishes to accomplish One Day Company Formation with the new SPICe forms. After the SPICe form has been prepared, individuals wishing to register a company must submit the e-MoA (INC-33) electronic form along with e-AoA (INC-34) to complete the company incorporation procedure. Memorandum of Association (MOA) defines the company’s relationship with its shareholders. It is the most important document of a company as it states the objectives of the company. It also contains the powers of the company within which it can act. 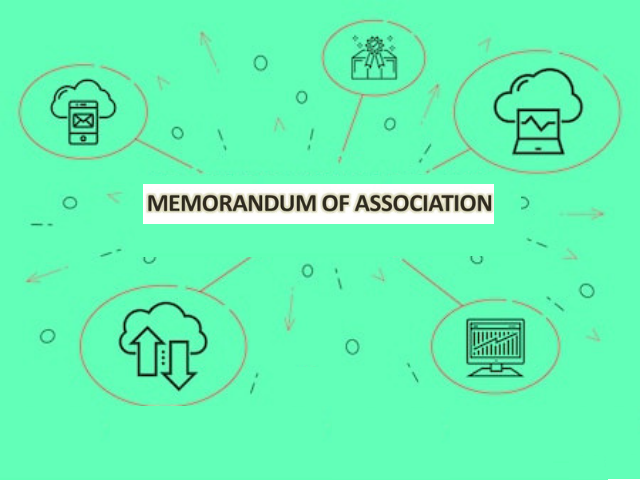 What’s the use of Memorandum of Association? The Memorandum of Association (MoA) helps establish the extent and scope of the business activities that a particular company can carry out. The company can perform business activities which they have specified in the Memorandum of Association (MoA). If you wish to expand your business activities into other areas of the market, you will have to make changes to the memorandum accordingly. A Memorandum of Association (MOA) is a legal document applicable for limited liability companies. Limited Liability Companies include Private Limited Company (Pvt Ltd) and Limited Liability Partnership (LLP). MOA is used to define the company’s relationship with the shareholders. The MOA is a document of public record i.e. anyone who wishes to see a company’s MoA can do so under the Right to Information (RTI) Act. MoA also describes the company’s name, the physical address of the registered office, names of shareholders and the distribution of shares. Somtimes, MoA also contains the exemptions and tweaks for a particular company. For eg. Private Limited Companies have a lot of exemptions as compare to other companies. Read: Exemptions Private Limited Company. The MOA and the Articles of Association (AOA) put together, serve as the constitution of the company. The MOA is not applied in the U.S. but is a legal requirement for limited liability companies in European countries including the United Kingdom, France, and the Netherlands, as well as some Commonwealth nations. The name of the company is its first unique identity. Thus the name clause of the memorandum consists of the authentic, legal and approved name of the company. Company names should not bear any similarities to a company registered with a similar name because many times these companies protect the name of their companies via a Trademark Registration procedure. The domicile clause comprises of all possible details of the registered office of the company. It has the name of the State or Union Territory of the registered office and may and may not have the exact address of the office. It also has the names of the registrars enrolled. Objects Clause constitutes the main body of the memorandum. It provides a list of all the operations of the company. Every motive and operation the company indulges in must be mentioned in the object clause. Also, any such operation which is not mentioned in the object clause is considered to be beyond the reach of the company. Gives protection to the subscribers as they have complete knowledge of where their valuable money is being invested. Protects the individuals and/ or companies which deal with the concerned company as they have knowledge of the extent of the companies powers. The board of directors of the company is restricted to using the funds of the company only to the objects specified in the Memorandum. Liability Clause mentions the liability of every member of the Company. It simply states that every member of the company has a limited liability. The clause also specifies the amount of contribution of agreed upon for each individual participant in case the company is closing or winding up. Read: Closing a Private Limited Company and Closing an LLP. Irrespective of the financial state of the company, no member can be told to pay more than the amount that remains unpaid on his/her shares. This clause mentions the share capital with which the company is registered. In addition to this, the capital clause should also mention the types of shares, the number of each type of share, and the face value of each share. Private companies and public companies not intended to be listed in the stock exchange may assume any face value depending on a number of factors however, public companies to be listed will have a prescribed face value of the shares. The last and final clause of the Memorandum of Association is called the subscription clause. The subscription clause basically lists down the motives of the shareholders behind the incorporation of the company and also states that the subscribers are agreeing to take up shares in the company. It also specifies the number of shares taken up by each subscriber. It is all according to the details specified in the MoA Subscriber Sheet.